The most enticing aspect of playing online poker is the sheer volume of variants you can unearth. 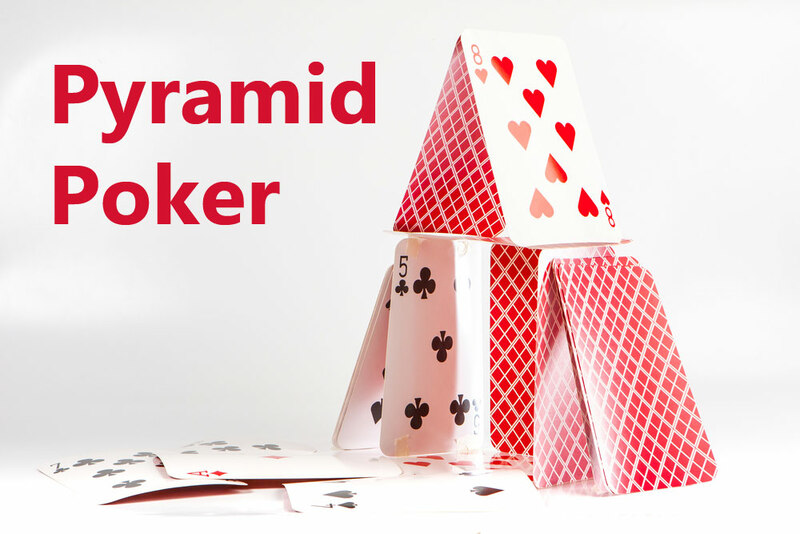 Pyramid poker is an entertaining blend of strategy and luck. Learning the basic rules of this version is only the beginning as two-thirds of any pyramid or iceberg are hidden from view. Pyramid poker is exactly the same with plenty of fun-packed action bubbling beneath the surface. The roots of the game lie in Pai Gow poker but it’s much easier to get the hang of pyramid poker. The object of the basic format is to construct two winning hands by using just three cards from a regular deck. The usual winning combinations of poker apply except there’s no room for either flushes or straights. Aces are played as high cards. You can have great fun playing this form of poker online at a table with up to nine players but you can still get plenty of enjoyment even if there are only two. It starts with players placing their bets in the pot. In return they each receive three cards from the dealer who also deals three cards to himself. Players then look at their cards and arrange them into distinct hands of one card and two. The only condition here is that the single card’s value must be less than the other two. Players’ hands are then compared to those of the dealer. Each player in turn compares the single card hand then the double. Card ranks with higher values win. Success with both hands brings a player even winnings. If you only win one of the hands the result is a push which means your bet is returned. Losing both of the hands to the dealer means losing your money altogether. However, this is just the tip of the iceberg. An extended format of pyramid poker involves receiving four cards. Six communal cards are placed face down in the centre of the table in a pyramid shape with three on the bottom row, two in the middle and one at the top. Betting and play is in rounds and you have the option of checking. After the first bets are safely in the pot, the two central row cards and the one in the centre of the bottom row are revealed. The top card is turned after the next round of bets then the last two cards. You are allowed to take a card from every row to help build your hands. The ultimate winner is the player with the highest cards. Wins are paid out at evens. If you and the dealer win a hand each you get your money back. If you fail on both your money is lost. If your cards match those of the dealer they are referred to as copies and belong to the dealer. The house edge for pyramid poker is 3.53%. With almost 131 million winning combinations at your fingertips you’ve got every chance of outwitting the dealer whenever you play this version of online poker. However, a few pyramid poker tips are sure to be helpful. When playing the basic three card version opt to place your medium ranking card in the single hand if you receive a two with a three or four and also with five or a queen or higher. It’s always worth playing pairs in the two card hand unless you receive a jack with a single two, three or four. The same strategy applies for a pair of queens with five, six or seven, kings with nine or eight and aces with a jack or ten. Experienced players always prefer to know how the dealer might play. Dealers often place the card with a middle value in the single card hand. Pairs will always go in the two card hand unless the other card has a value of three ranks less. In this case the dealer will usually split the pair between the hands. For instance, if there’s a seven with a pair of tens the pair will be split as would a pair of queens with a nine. From the tip of the iceberg to the hidden depths, pyramid poker is a game you have to try!